Disruption is the New Normal. Is Your Company Ready? The SAP Hybris LIVE: Digital Summit 2017 was all about disruption. The event itself disrupted both space and time by moving seamlessly from Singapore to Munich to New York and proving a live global experience accessible to audiences in every time zone. During the New York segment, a panel of business leaders from a diverse set of industries took the stage to discuss Disruption and Change – The New Normal. 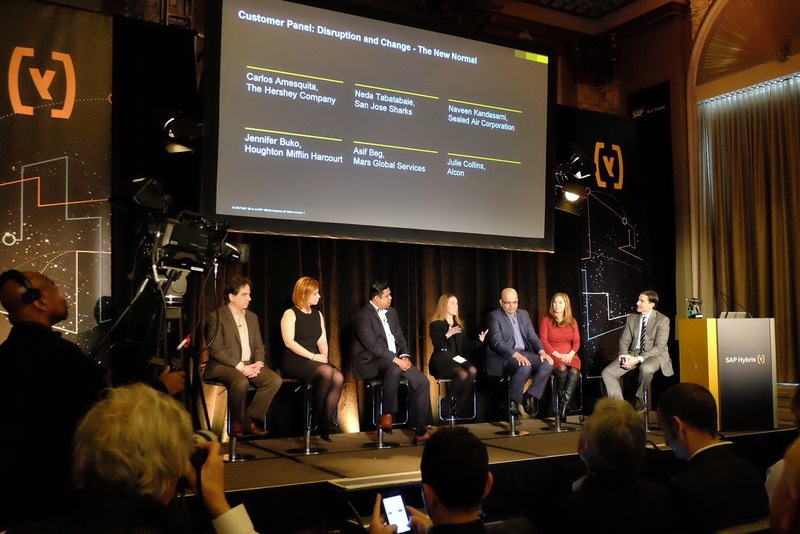 To get the conversation rolling, moderator John Gurski, Senior VP and General Manager, SAP Hybris asked the panel to describe the biggest disrupters facing them today. Julie Collins, global head of digital at Alcon, said the speed of change and high expectations coming from customers and patients are key disruptors for them. Alcon has to provide solutions and information faster and more efficiently than ever before. According to, Asif Beg, director and digital enterprise architect at Mars Global Services, CPG companies are facing disruption from increased online shopping and new players invading the space. He said, as in-store shopping diminishes, CPG companies need to find the next avenue to consumers. In addition, they need to prepare for tough new competition coming from outside the industry, like from IT and software companies that become manufactures. Jennifer Buko, director of financial services, governance, and insights at Houghton Mifflin Harcourt, said her company is trying to be a disruptor and pacesetter in an industry going through major upheaval. The physical world of print media is turning digital and the advent of new services is changing the business model. Her company needs to be able to offer a complete package of products and services to its customers. Professional sports are also facing disruption. Neda Tabatabaie, vice president, business intelligence at the San Jose Sharks said sports consumption habits have changed drastically. Five years ago people watched sports very differently both in the stadium and at home. She said the digital and mobile revolution has really impacted the industry and they have to make sure they provide a unique and engaging experience for fans inside and outside the arena. Carlos Amesquita, CIO at The Hershey Company said that changes in the way people eat and shop are disrupting his business. People no longer sit down to eat three meals a day. They snack throughout the day and care more about what they put in their bodies, which means greater transparency around ingredients is expected. And as brick and mortar retail declines, so does impulse buying in checkout lines. He said whoever solves that problem will win. So what are these companies doing about the disruptions they face? Common focus areas were better data and analytics, deeper customer engagement, and increased business speed and agility. Amesquita said Hershey’s former CEO characterized it as a knowledge company that happens to make chocolate. Knowing your consumers, what they want and when and where they want it, is very important. The key is turning excessive amounts of data into useful information and insight. Beg said, to tackle CPG market disruption, Mars has to find where the consumer is in their buying journey and meet their needs. They can no longer just rely on strong brand awareness and traditional marketing and sales channels to sell products. They have to become an influential content marketing and social media company as well. Collins said Alcon is focused on speed to market. Customers can’t react and give feedback on products sitting behind the walls of the company. They work to get viable products into the hands of customers quickly, then iterate to make the products better. She said done is better than perfect in a competitive market. Tabatabaie said it all comes down to data. In sports, the traditional business model was if your team wins your stadium sells out. But that has changed. San Jose Sharks are investing in technology that makes them more intelligent about its customers and the products and services it offers. She said anything that is data driven and is going to make life easier and better for the fans is a priority. Kandasami said disruption has prompted Sealed Air to think differently about customer engagement. They are approaching customers with a knowledge based attitude not a traditional product or service offer. They have flipped the conversation to value selling and are coming up with solutions for customers that will save them time and money. Buko said HMH has to take a collaborative approach and be agile to get ahead of the disruption. Optimizing technology and data is critical. Traditional economic and demographic information is not the only piece of information driving the company’s growth or go-to-market strategy anymore. In the end, all panelists agreed that disruption can create opportunities, if you embrace it. Collins said when you see disruption as a window of opportunity it makes you look at your business a lot differently. Beg said disruption can open the boundaries of organizations and help look at the world from the outside in. Don’t create products in isolation and push them out. Knowledge is power, connect with customers, listen, engage, and sense what their needs are and move in that direction. It seems like companies are doing a better job at recognizing disruptions that affect their business and responding more quickly. There are many ways to handle the disruptions as your summary reflects. Thanks for posting.